Offering swimsuits for women, men and children, Banana Moon combines quality fashion with unequaled comfort and the latest trends. The brand's style can be summed up in three words: fun, comfort and style! Banana Moon takes you to a world where the sun is shining all year long. The joy of life sails through the 2019 swimsuit collections with models that will put you in a sunny mood! The brand combines cuts of flowing materials, delicately ehanced with embroidery, crochet or vibrant prints. When you wear a Banana Moon bikini you shine with the trendy and sunny values of the brand! When your vacation comes to an end, Banana Moon keeps it going with clothing, accessories and beachwear designed to complement its wide selection of swimsuits. To forget the weather and routine, get a trendy fashion look and fill up on vitality all year long. Feet in the water or out on the sidewalk, head for sunny spirits with a foolproof trendy style for any occasion thanks to Banana Moon's spring-summer and fall-winter collections! Fall in love with summer all over again with the latest Banana Moon women's beachwear collection. By the shore or at the pool, soak up the sun in style with the laid back West Coast appeal of our new season edit. Discover fabulous dresses, cute shorts and girly playsuits in sunshine colours and captivating prints: from sleek high leg swimsuits to flirty rompers, our collection will take you through the summer in style. Capture the sporty chic look with high waist bikini bottoms and bralettes - with pieces available separately in a wide range of standard American sizes, everyone can find the perfect fit to suit their body shape. Whatever your plans for the summer, our chic bathing accessories are the perfect way to being a dash of personality to your summer look: from beach towels to sunglasses, foutas and tote bags, we have everything you need to shine this season. Good living, warm weather, beaches and Californian landscapes inspire so many dreams! At Banana Moon, each bikini communicates the positive values so characteristic of the US West Coast where city life and nature coexist in harmony. 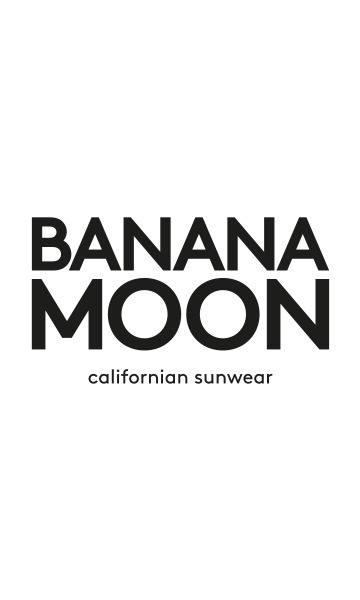 Driven by the California spirit, Banana Moon soaks up the summer attitude and sun with swimsuit models designed for sunny spirits, vitality and top trends!